Plastic Coatings Corporation is a leading manufacturer of premier waterproofing and protective coatings for diversified industries. In business since 1958, we serve clients all across the Americas and Canada. As a top coating manufacturer company, we have different formulating approaches in creating acrylic elastomer coatings that best fit your unique needs. While we started by servicing chemical companies and mechanical insulator companies, we now have a strong presence in many different business sectors. 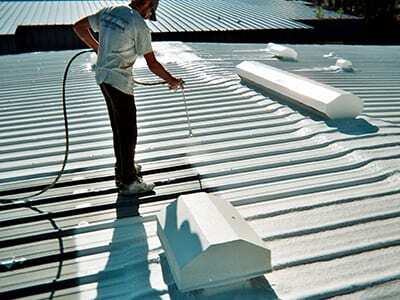 Our roof coatings can be utilized for repairing and renewing metal roofs, sprayed polyurethane foam, asphalt and modified bitumen roofs. Spray roofing technology not only allows the waterproofing coating to be custom fit to your roof, and reflectivity can increases the lifespan of your while reducing air conditioning cost. Our USDA/FDA coatings are designed and formulated for resurfacing interior walls, ceilings and architectural elements as well as coating thermal insulation. Tested for daily wash-down processes, our Jaxsan line is a very cost effective way to resurface food processing areas and maintaining F.S.I.S compliance. Theatre and Scenic Design companies use Jaxsan 600 because of its elasticity, versatility, paintability, waterproofing, fire retardancy and the ability to “reskin” surfaces. It is widely used by theatre companies, movie and set design firms for their productions. Want us to assist you with our supreme-quality coating products? Contact us today!